In the absence of an Overview essay for the sphenoid region, this survey of the sphenoid ossification must do for now as an introduction to this region. The following is drawn largely from medical sources, and may or may not apply in non-humans. The sphenoid is the object looking like a giant ossified butterfly in the images on this page. Like the ethmoid it is both a region and a bone. Considered as a region, the sphenoid is the second of the four main sectors of the braincase. Structurally, it underlies and supports the bulk of the brain. In addition, it tends to get involved in lateral support of the brain as well, and includes the alisphenoids, orbitosphenoids and similar vague, accessory ossifications, the primary purpose of which is to keep things from sloshing around. Like the ethmoid and otic regions, it is strongly associated with a suite of important sensory structures. The sphenoid region is most obviously associated with the orbit and the neural hardware supporting the sense of vision. However, it also includes the sella turcica, which is not only the home of the adenohypophysis but also has strange and poorly understood relations to the eyes. See The Basisphenoid. Finally, and even more mysteriously, the sphenoid region supports the portion of the brain containing the median light-sensitive organs of the pineal and associated structures. Vision, like hearing and smell/taste, is not entirely a unitary sense, particularly when considered in evolutionary perspective. Considered as a bone, the sphenoid is a basisphenoid with ambition. If the sella turcica is the "Turk's saddle," then the sphenoid bone is a sort of Ottoman Empire: heterogeneous, loosely assembled and built generally on the grounds of its imperial predecessor, the sphenethmoid. In some derived mammals, such as Homo, the sphenoid combines the basisphenoid, alisphenoid, orbitosphenoid, and presphenoid (an ethmoid ossification, or perhaps an anterior extension of the basisphenoid), as well as incorporating portions of the pterygoid. As a reminder, the pterygoid is a dermal bone; and the alisphenoid is retreaded epipterygoid which traces its ultimate origin to the palatoquadrate and the gill arch series. The sphenoid thus incorporates derivatives of all three embryonic skull tissues: the endochondral bone of the neurocranium, the dermal bones of the palate, and gill arches. The sphenoid, at least in its most expansive form, is apparently found only in some mammals. 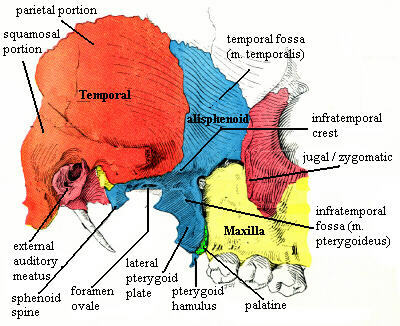 In fact, I have not seen any mention of anything like the human sphenoid outside the primates. Then again, what I have or have not seen is a poor proxy for the actual state of the universe. It may be that the components of the sphenoid vary considerably from one mammalian taxon to another. In any event, we lack sufficient reliable information for a phylogenetic survey and must be content with tunnel visions of our medical brethren. The description below follows closely the classical (1918) description in Grey's Anatomy, which Bartleby's has thoughtfully placed on-line, along with a number of other priceless references. "Follows closely" is, of course, a euphemism for blatant plagiarism. However, the discussion here is reorganized and edited for relevance to areas of potential interest in our usual inquiries. A good deal of the nomenclature has also been changed. Thus suitably translated, the treatment in Gray's remains remarkable useful. The illustrations from Grey's, also reproduced here, tend to have a somewhat cubist quality. That is, strict perspective is occasionally sacrificed for the sake of showing as many features as possible in a single illustration. On the internet today, just as in Grey's time, too many images make a reference unreasonably bulky and expensive to produce. Thus, these stylistically simple, but highly detailed line drawings are once again perfect for a low-budget guide, so long as the reader is cautious. The dorsal surface of the sphenoid body consists of the basisphenoid and presphenoid ossifications. The body is marked anteriorly by a prominent spine, the ethmoidal spine, which articulates with the cribriform plate of the ethmoid. The ethmoidal crest is continuous with a sphenoidal crest on the anterior face which articulates with the perpendicular plate of the ethmoid and forms part of the nasal septum. Behind the ethmoid spine is a smooth surface slightly raised in the midline, and grooved on either side for the olfactory lobes of the brain. This surface is bounded behind by a ridge, which forms the anterior border of a narrow, transverse groove, the chiasmatic groove (optic groove), posterodorsal to which lies the optic chiasma. The groove ends on either side in the optic foramen, which allow the optic nerve and ophthalmic artery into the orbital cavity. Behind the chiasmatic groove is an elevation, the tuberculum sellae; and still more posteriorly, a deep depression, the sella turcica, the deepest part of which holds the adenohypophysis. The anterior boundary of the sella turcica is completed by two small eminences, one on either side, called the middle clinoid processes, while the posterior boundary is formed by a square-shaped plate of bone, the dorsum sellae, ending at its dorsolateral corners in two tubercles, the posterior clinoid processes. The posterior clinoid processes deepen the sella turcica, and support the pila antotica, in organisms in which the pila is present. See also discussion at the pleurosphenoid. On either side of the dorsum sellae is a notch for the passage of the abducens nerve (cranial nerve VI). The abducens enervates the lateral rectus muscle of the eye which rotates the eyeball laterally. Below the abducens notch is a sharp process, the petrosal process, which articulates with the anterior apex of the petrosal (or the petrous portion of the temporal bone), and forms the medial boundary of the (anterior?) lacerate foramen. Behind the dorsum sellae is a shallow depression, the clivus, which slopes obliquely backward, and is continuous with the groove on the basioccipital (basilar portion of the occipital bone). The lateral surfaces of the basisphenoid section are fused with the great wings and the medial pterygoid plates. Above the attachment of each great wing is a broad groove, curved something like the italic letter f. This groove holds the internal carotid artery, and is thus unsurprisingly named the carotid groove. The rectangular posterior surface is joined to the basioccipital by a plate of cartilage. In humans, the connection ossifies during early adulthood. The anterior surface of the sphenoid body is dominated by the sphenoidal crest, discussed above. On either side of the crest are air sinuses, the sphenoid sinuses, which are partially roofed over by the sphenoid conchae. The sphenoid sinuses are also subdivided by irregular ridges of bone. The sinus systems are quite variable even among the mammals, and are briefly taken up in the discussion of the turbinals. The ventral surface of the sphenoid body bears a triangular spine along the midline, the sphenoidal rostrum, which is continuous with the sphenoidal crest on the anterior surface, and articulates with a deep fissure between the wings of the vomer. On either side of the rostrum is a projecting lamina, the vaginal process. This process is directed medially from the base of the medial pterygoid plate, with which it is described below. The great wings are the alisphenoid contribution to the sphenoid. "Alisphenoid" = ala L. for "wing") + sphenoid. So now you know. The alisphenoids grow out laterally from the basisphenoid + presphenoid, and are curved dorsolaterally and posteriorly. The posterior part of each alisphenoid forms a triangular process which fits into the angle between the squamosal and the petrosal. The posterior end of the alisphenoid also bears a ventral process, the spina angularis (sphenoidal spine). Presumably, this is an evolutionary remnant of the quadrate ramus of the epipterygoid (= alisphenoid). The dorsal surface of each alisphenoid is deeply concave, and is ornamented with depressions for the convolutions of the temporal lobe of the brain. Anteromedially, the alisphenoid is pierced by the foramen rotundum, through which the maxillary nerve, (= CN V2, or the maxillary branch of the trigeminal nerve) exits the braincase. Posterolateral to the foramen rotundum is the foramen ovale, for the exit of (most significantly) the mandibular nerve (=CN V3, or the mandibular branch of the trigeminal nerve). The lateral surface of the alisphenoid is difficult to describe in isolation, and is most readily conceived in osteological context, as shown in the third figure (the colored image on the right). This surface is divided into dorsal and ventral halves by a transverse ridge, the infratemporal crest. The dorsal or temporal portion, forms a part of the temporal fossa. The m. temporalis originates broadly on this surface and inserts on the coronoid process of dentary. Its primary function is to close the jaw. The concave ventral or infratemporal surface forms part of the infratemporal fossa. Together with the infratemporal crest, this surface is the origin of the upper head (at least) of the m. pterygoideus externus, a/k/a pterygoideus lateralis. The lateral pterygoideus inserts on the back of the jaw and on the capsule of the temporomandibular joint itself. It acts to open the jaw, as well protracting (protruding) the lower jaw. Posteriorly, the alisphenoid is pierced by the foramen ovale. The posterior end bears the sphenoid spine (spina angularis), which is frequently grooved on its medial surface for the chorda tympani nerve. The primary purpose of the sphenoid spine appears to be the attachment of the dorsal end of the sphenomandibular ligament. This ligament is derived from the middle section of Meckel's cartilage. The more posterior sections are adapted as the maleus and incus of the middle ear. Since the sphenomandibular ligament represents the more distal portion of Meckel's cartilage, we find, as we might expect, that the ventral attachment of the ligament is located on the lower jaw, on a ridge of bone adjacent to the mandibular foramen. The orbital surface of the alisphenoid is smooth, generally quadrilateral in shape, and is directed anteromedially. It forms part of the lateral orbital wall. Its articulates dorsally with the frontal. Its lateral margin and articulates with the jugal zygomatic). The lesser wings of the sphenoid are formed by the orbitosphenoids. The orbitosphenoids are thin triangular plates, which arise from the anterodorsal part of the body, i.e. the presphenoid. They project laterally, ending in sharp points. The dorsal surface of the orbitosphenoid is flat, and supports part of the frontal lobe of the brain. The dorsal surface forms the inner part of the roof of the orbit. The anterior border of the orbitosphenoid articulates with the frontal. The posterior border, smooth and rounded, inserts into the lateral fissure of the brain. The medial end of this border forms the anterior clinoid process. The orbitosphenoid is connected to the presphenoid by two roots, the upper thin and flat, the lower thick and triangular; between the two roots is the optic foramen, for the transmission of the optic nerve and ophthalmic artery. The pterygoid processes, one on either side, descend perpendicularly from the regions where the sphenoid body and alisphenoids unite. Each process consists of a medial and a lateral plate, the upper parts of which are fused anteriorly. A vertical sulcus, the pterygopalatine groove, descends on the front of the line of fusion. The plates are separated below by an angular cleft, the pterygoid fissure, the margins of which are rough and articulate with the pyramidal process of the palatine. The two plates diverge behind and enclose between them a V-shaped fossa, the pterygoid fossa, which contains the medial pterygoid muscle = m. pterygoideus internus). Above this fossa is a small, oval, shallow depression, the scaphoid fossa. The anterior surface of the pterygoid process is broad and triangular near its root, where it forms the posterior wall of the pterygopalatine fossa and presents the anterior orifice of the pterygoid canal. The lateral pterygoid plate is broad, thin, and everted; its lateral surface forms part of the medial wall of the infratemporal fossa, from which the lateral pterygoideus muscle originates, as mentioned above. The medial pterygoid plate is narrower and longer than the lateral. It curves laterally at its distal end into a hook-like process, the pterygoid hamulus, around which the tendon of the Tensor veli palatini glides. The lateral surface of this plate forms part of the pterygoid fossa. The medial surface constitutes the lateral boundary of the choana. Superiorly the medial plate is prolonged on to the under surface of the body as a thin lamina, named the vaginal process, which articulates in front with the sphenoidal process of the palatine and behind this with the ala of the vomer. On the under surface of the vaginal process is a furrow, which is converted into a canal by the sphenoidal process of the palatine bone, for the transmission of the pharyngeal branch of the internal maxillary artery and the pharyngeal nerve from the sphenopalatine ganglion. The anterior margin of the plate articulates with the posterior border of the vertical part of the palatine bone. ATW021117.